Benefit from pre-designed PowerPoint templates consisting of 48 slides at your next presentation. Insert your own content easily and save valuable time. 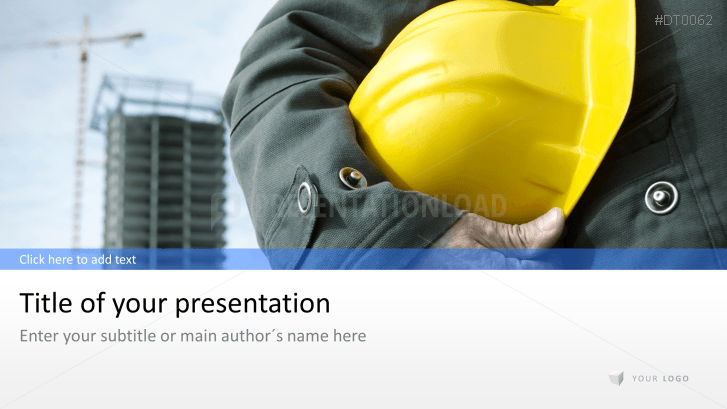 Within minutes, you create a sophisticated presentation on any subject matter related to the construction sector. You will be provided with templates to create agendas, overviews on contact information and social media channels. Present numbers, figures and important data in pre-formatted charts and tables and choose from a collection of diagrams and timelines the one suiting your own purposes. The template “Construction Industry” is linked to the PowerPoint color palette which allows you any adjustments according to your corporate design. Find attached a tutorial to guide you through the process of creating a professional business presentation.